If you have golden ears, a golden pocketbook with which to indulge them, and an iPhone 4/4S with a music library encoded in Apple Lossless, you’ll want to know about the V-Moda Vamp. If music isn’t your passion, and you think audiophiles are fools with more money than sense, forget I ever mentioned this exquisite headphone amp and DAC (digital-to-analog converter), which comes in the form of an iPhone case with extended battery. It's priced at a cool $650. If you’re wondering why any rational human being would buy a headphone amp, you’re probably doubly dubious about buying a headphone amp for a phone—and triply dubious about a headphone amp for a phone that costs more than the phone itself. After all, an iPhone can pump enough decibels into your ears to damage your hearing all on its own, right? And you’re right; no one needs a headphone amp any more than they need an expensive smartphone—the Vamp is a high-performance luxury item designed to augment one of the iPhone’s many capabilities, music reproduction. But if you’re a serious music listener, you buy a headphone amp in order to hear musical details that—provided you have high-quality headphones—the built-in headphone jack on most consumer electronics can’t reproduce. 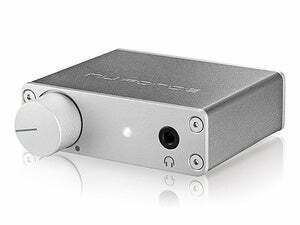 A good headphone amp’s additional power and upgraded circuitry simply let your high-end headphones perform better. The Vamp looks a lot like a (bulky) iPhone case, and it is, albeit one that also includes a headphone amp and a 2200mAh battery that can power both the amp and your iPhone. When you secure your iPhone in the Vamp, the Vamp taps into the iPhone’s dock-connector port to grab the phone’s digital-audio output. Most audio docks for iOS devices—with Bowers & Wilkins’ Zeppelin line among the notable exceptions—instead access the iPhone’s analog-audio output, using the iPhone’s internal circuitry to convert your digital audio files to an analog signal. The Vamp has a built-in, higher-end digital-to-analog converter (DAC) that performs this task, with the idea being that you’ll get a better-sounding analog signal. The Vamp doesn't just look like a spare battery when docked to your iPhone 4/4S, the flip of a switch enables the iPhone to draw power from the Vamp’s 2200mAh battery. The Vamp taps the iPhone 4’s digital audio output and passes the bitstream to a DSP (digital signal processor). The DSP upsamples the digital audio data to 48kHz and 16-bit resolution, to alleviate jitter (slight deviations in timing that can result in undesirable noise). From there, the signal travels to a DAC (digital-to-analog converter; specifically, AKM Semiconductor’s AK4353). The analog signal is routed to a high-end operational amplifier, or op-amp (a Burr-Brown OPA1612), which is the component that ultimately drives your headphones. I tested the Vamp with several high-quality headphones, including a pair of custom-fitted JH Audio JH|13 in-ear monitors (shown in the photo above), a set of Bowers & Wilkins P5 travel headphones, and a pair of Ultrasone HFI 2400 open-back headphones. None of those are particularly difficult for an amplifier to drive—the HFI 2400’s have the highest impedance at 70 ohms—but the Vamp is outfitted with a gain switch that will boost its output to drive phones with much higher impedance (such as the 300-ohm Sennheiser 650’s). I loaded an iPhone 4 with a variety of music purchased from the Bowers & Wilkins’ subscription music service, Society of Sound. Each recording was encoded at the source using Apple Lossless format (in other words, I didn’t rip the tracks from a CD and encode them myself). The albums ranged from rock artist Peter Gabriel’s Scratch My Back, to classical composer Eric Whitacre’s Water Night, to Irish folk singer Cara Dillon’s Live at the Grand Opera House. In this respect, I found being limited to Apple Lossless to be a bit of a drag. You see, SoS’s Apple Lossless albums are encoded with 16-bit resolution and a sampling rate of 44.1kHz; but they offer many of the same albums encoded in FLAC (an open-source lossless audio format) in 24-bit resolution at a sampling rate of 96kHz. V-Moda says it's considering offering a second version of the Vamp for an Android phone, but the company hasn’t decided which phone to support first. A recessed switch toggles between two gain settings: Lo for driving typical headphones, and Hi for driving high-impedance models. A silicone collar wraps around the edge of the iPhone to offer a modicum of shock protection. Aside from that limitation, I found the Vamp to be superbly transparent. Listening to Eric Whitacre’s “Alleluia” (one of the SoS releases that available in 24-bit/96kHz FLAC as well as 16-bit/44.1kHz Apple Lossless), the tiny amp reproduced the a cappella recording without adding any coloration or masking any element of this superb performance. And that’s the way it should be. But V-Moda was apparently unable to resist the temptation of using the onboard DSP for more than just sample-rate conversion: A second switch on the bottom of the amp activates VQ mode, which, according to V-Moda’s marketing materials “adds a slight spatial 3D soundstage, tightened bass, and increased treble attack that invigorates an all-around sensory experience.” Uh, thanks, I think I’ll leave that feature turned off. Assume for a moment that you're ready to open your golden pocketbook and part with 650 doubloons to indulge your golden ears, and this fall the iPhone 5 hits with an entirely different form factor and a retooled docking port. What then? 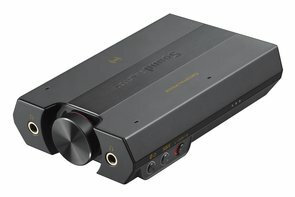 The Vamp’s headphone output doubles as a Toslink optical digital output, so you can retire your iPhone 4 to serve as a digital audio transport device that you connect to an A/V receiver or an outboard DAC. Then you can wait for V-Moda to introduce an iPhone 5 version of the Vamp. As for me, I think I’ll wait for the Android version to surface.